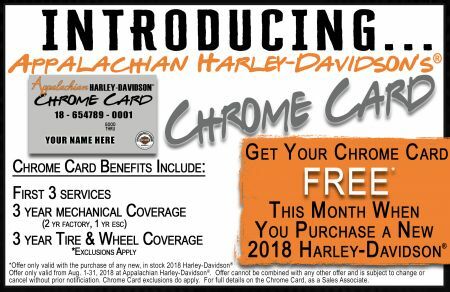 *Offer only valid with the purchase of any new, in stock 2018 Harley-Davidson®Offer only valid from Aug. 1-31, 2018 at Appalachian Harley-Davidson®. Offer cannot be combined with any other offer and is subject to change or cancel without prior notification. Chrome Card exclusions do apply. For full details on the Chrome Card, as a Sales Associate.